Rick Stein’s fabulous Far Eastern Odyssey was recommended to me by the lovely Tina of Cook with Tina as I recall it following a discussion on Thai Mussaman Curry and I am eternally grateful as this truly is a brilliant book and contains a fantastic recipe for one of my favourite dishes – Chicken Tikka Masala. 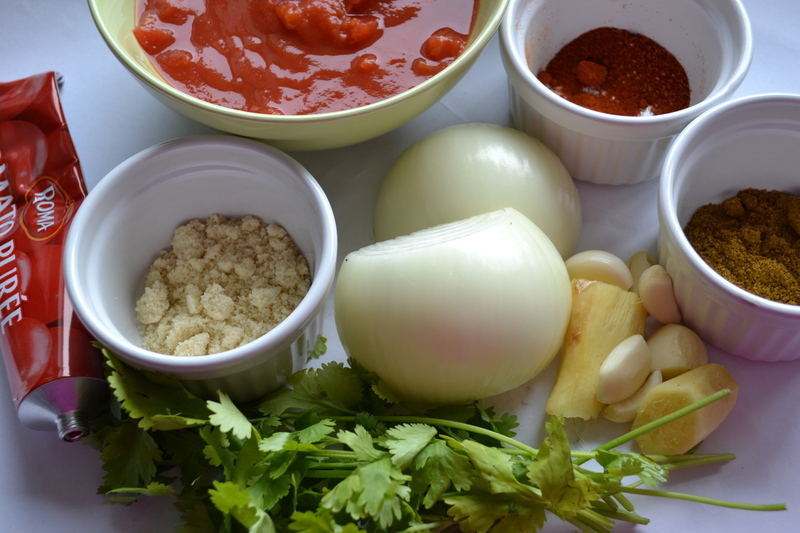 I have tried lots of different recipes for this dish over the years without great success – some cheaty quick ones with ready-made pastes and others more detailed and long-winded. Rick Stein’s recipe doesn’t really contain that many ingredients but is definitely more suited to a day when you have a bit of time on your hands but it is worth it – it is the best I have tried by far and I really think that this particular dish doesn’t benefit at all from shortcuts. I buy my spices at fairly reasonable prices online from Spices of India and I also bought the cast iron Karahi pictured below for around £15 and it has become much used and valued. The other great thing about this recipe is that you can just do part one of the process – the marinating of the chicken breast – and cook on skewers on a BBQ in summer as a kebab with onions and peppers and it will be delicious served up in pitta or flatbreads with some mint and cucumber raita. I made a few minor changes from the recipe in that I used a tin of chopped tomatoes instead of 225g chopped fresh tomatoes, I omitted the food colouring, I do not use any cardamom seeds in the sauce as I find too much can be a little ‘soapy’ and I didn’t add any fresh green chillis at the end of cooking. I had run out of ghee so I used a mix of unsalted butter and rapeseed oil. The quantities below serve 4. 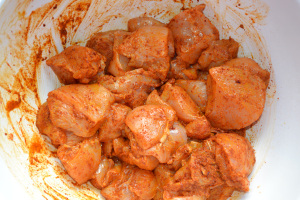 Cut the chicken breasts in to large chunks and put in to a large non-metalic bowl together with the lemon juice, chilli powder, paprika, turmeric and salt. 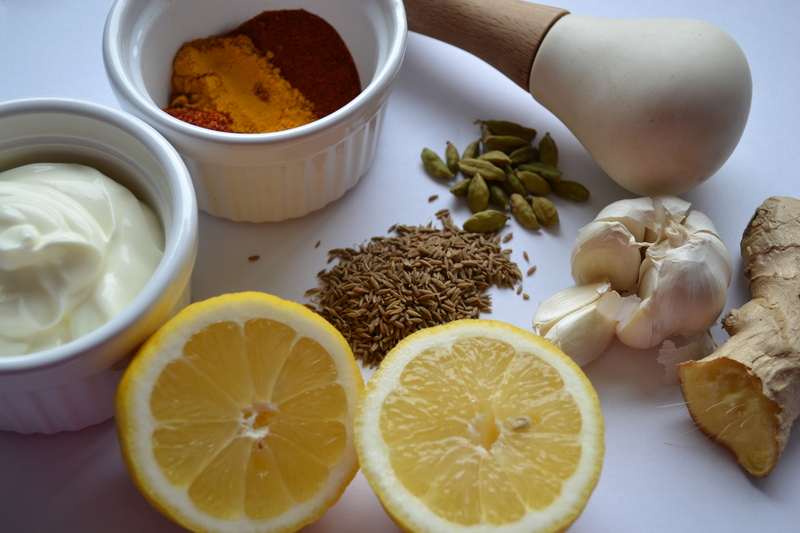 Mix together well until all of the chicken is coated in the spice mix. 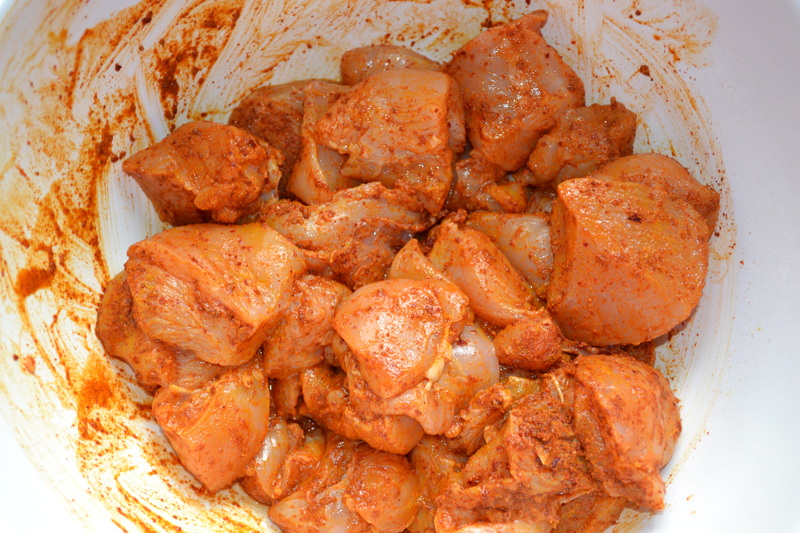 Leave to marinate for around 20 minutes. Heat a heavy based frying pan on medium heat and add the cumin seeds, toasting them lightly for a few seconds until the become quite aromatic. Remove the seeds from the pan on to a plate and allow to cool. Now add the coriander seeds to the pan for a couple of seconds before removing to cool on the plate with the cumin. When the seeds have cooled grind the cumin seeds first and reserve one teaspoon for the sauce. Grind the coriander seeds and add with the cumin, yoghurt, garlic and ginger to a food processor and blend until fairly smooth. Add the yoghurt mix to the chicken, mix well and leave to marinate at room temperature for around 20 minutes. 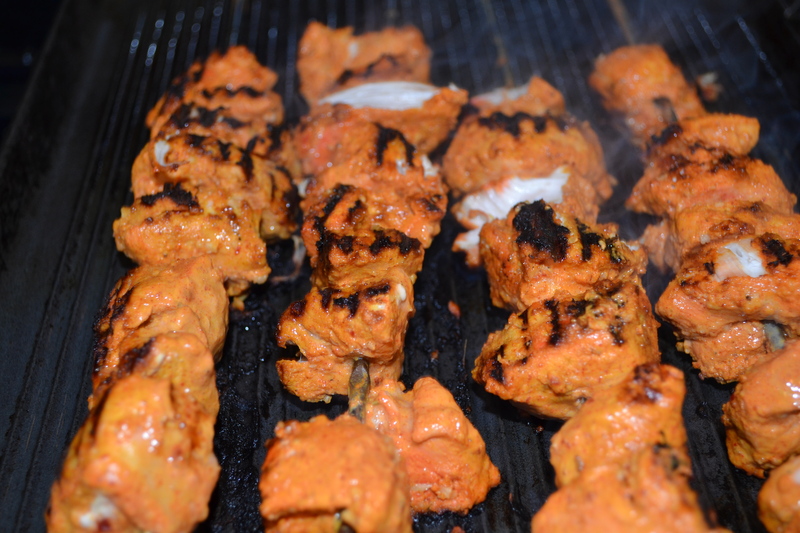 Note: chicken should not be marinated for too long in yoghurt as it becomes quite ‘cotton-woolly’ when cooked – it is best marinated for a max. of one hour so do not do this part too early if you don’t intend to cook until later. 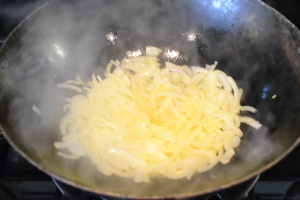 Heat the butter and oil in a large pan or wok over high heat and add the finely sliced onions. Cook, stirring occasionally, until the onions are soft and quite golden. Add in the garlic and ginger and cook for 2-3 minutes then add the cumin that you reserved earlier when making the marinade, chilli and paprika and stir well. Cook for a further 1 or 2 minutes. Then add in the tomatoes, puree, ground almonds and boiling water and salt, lower the heat to medium and simmer for around 10 minutes. Brush a large griddle pan with oil and heat on high. 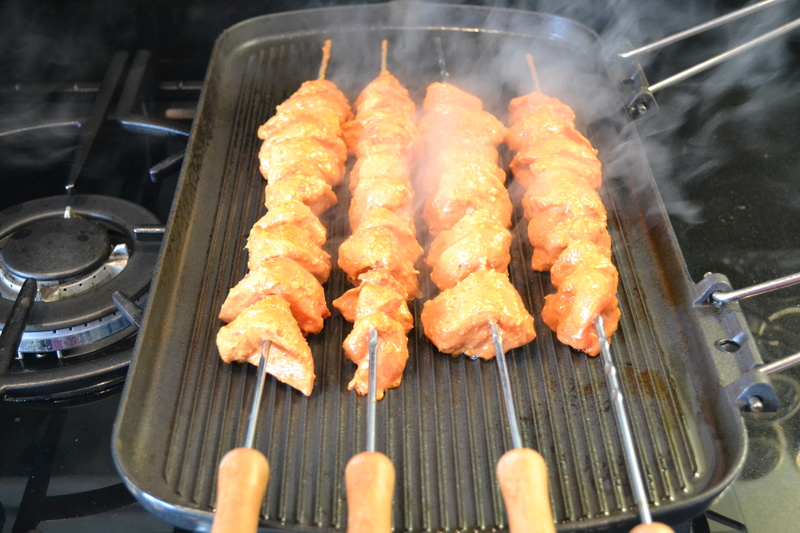 Remove the chicken pieces from the marinade and thread on to skewers. 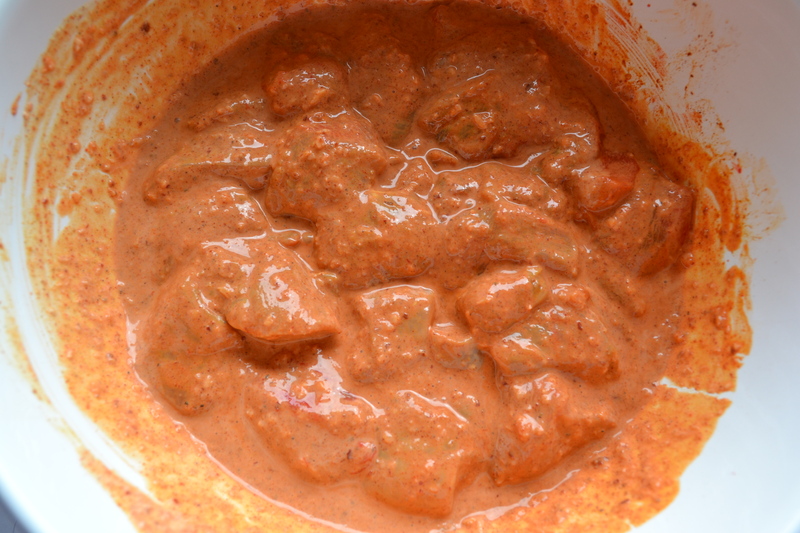 Stir the remaining yoghurt marinade in to the simmering sauce and add the cream and garam masala and lower the heat. 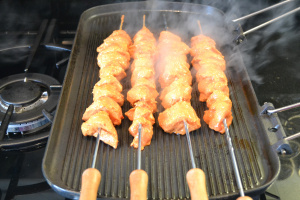 When the griddle is smoking hot place the skewers carefully on it to ensure all of the chicken is touching the hot surface. Cook for 4 minutes and then turn over and cook for another 4 minutes. The chicken should look lightly charred. Slide the chicken pieces off the skewers into the sauce and allow to simmer for a further 5 minutes, then add the lemon juice and chopped coriander, simmer for 1-2 minutes and then serve with basmati rice and flatbreads. Bill's Basics by Bill Granger (Quadrille Publishing)In "Christmas"
Looks yummy. Love Rick Stein too. Will dream about masala tonight. Hello Mona – yes Rick Stein is a bit of a food hero in my books, I love his style and was so pleased that this really worked as it is my first book of his. The original recipe called for food colouring?! Crazy! 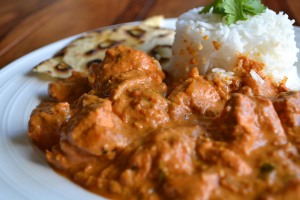 I love tikka masala too, this looks great. Hi Kristin :) I know!! I thought it was a bit odd too but I guess he was being authentic as they use colouring in India? I made it twice, first time with a teeny dash of red colouring and second time without and it really doesn’t need it. Aw I love Rick Stein. He seems like such a nice bloke. And his food is awesome! I use his kedgeree recipe – best hangover cure EVER. Is the Karahi the iron grill that you cooked the chicken on? £15? So cheap! Looks like a gorgeous curry – good work! The Karahi is the cast iron wok – it was dog-rough when it arrived and takes a bit of work to season it but it is fantastic – I use it all the time now. I got the griddle from http://www.divertimenti.co.uk – it was much cheaper than Le Creuset and fits over two rings so it’s quite a handy size! Hi EM :) oh I think you will love it! At first some recipes look a bit daunting because of the ingredients but once you buy them there is so much you can make – I can’t wait to try more. Oh wow, that looks great! And I love how it looks on the skewers too!